The POLYQuik FASTPATCH line of products gives you the tools to repair concrete spalls, break-outs or voids in everything from airport runways, busy highways and roadways, to warehouse buildings, parking lots and sidewalks, and more. With each of these products you will experience excellent adhesion to concrete and an impressive cure rate that allows the repaired area to be open for use in as little as one hour! If the problem is up high, down low, in cold or warm temperatures, big or small, you will find the perfect solution in one of our FASTPATCH Products. With the family of FASTPATCH Products you have the ability to repair damaged pavement no matter what the situation or the environment. FASTPATCH DPR (Distressed Pavement Repair) Our most popular line of pavement repair solutions for both Concrete Repair and Asphalt Repair that are fast-curing and ultra-tough! 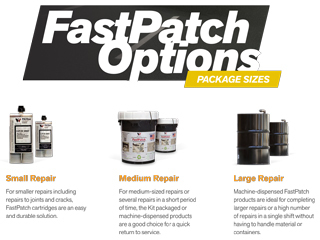 Each Pre-Measured Kit is designed with ready-to-use packaging, containing everything you need to complete your repair.. FASTPATCH DPR is made from 80% recycled & renewable materials - Environmentally friendly and sustainable sources. FastPatch DPR has excellent adhesion, absorbs impact and is freeze-thaw resistant. Easily create smooth transitions and ultra-tough level surfaces. Easy to install and long-lasting! FASTPATCH 5000 rapid roadway repair is designed to pour or dispense into cracks and voids in concrete roads. High-flexural formula allows it to perform exceptionally well under heavy loads. Repaired areas can be opened to traffic in as little as one hour. Easily fill cracks or voids with superior adhesion to concrete. FASTPATCH LV’s low-viscosity formula allows it to perform exceptionally well in below-freezing conditions. Easily fill cracks in concrete with tremendous bond strenth. FASTPATCH NS’s non-sag formula is the ideal solution for repairing cracks in concrete and damage that is vertical or overhead. Also excellent for bonding road reflectors on both horizontal and vertical surfaces. FASTPATCH MD is meter dispensed with the WV-200 or WV-410 MD Polymer Applicator Systems and is perfect for repairing large areas of damaged concrete. Machine dispensed flexible polymer engineered for large and medium-sized spall and crack repair concrete applications. Available in both self-leveling and Slope Grade versions. 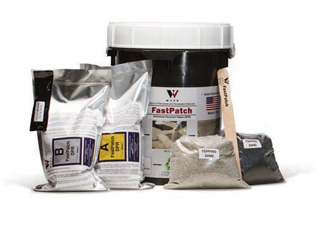 View the FASTPATCH Product Selection Guide to determine which product is appropriate to your pavement repair needs. FASTPATCH EJC Elastomeric Joint Sealant product line for expansion joint repair is a unique hybrid polyurea that passes the testing needed for highways, bridges and airports that no other product of its kind can achieve. EJC-25, EJC-NS, EJC-50 and EJC-100 have the durability to hold up to joint expansion and contraction, and daily abuse of road traffic. Even under extreme weather conditions they retain the high performance characteristics needed for years to come. View the EJC SEALANTS Product Selection Guide to determine which product is appropriate to your expansion joint repair or restoration requirements.